Daytime vet Alla Korot, soon to be a guest star on General Hospital. As a General Hospital fan, recent behind-the-scenes and casting changes at our favorite soap have had us on the edge of our seats, haven’t they dear Soap Cities readers? One of the main bones of contention between GH and its fans has been the recent comings and goings. Case in point: many of us fans are upset about the dismissal of Rebecca Budig as Hayden Barnes. While she started out as an unpopular character with no ties on the show’s canvas, she eventually won us fans over as the recently revealed half-sister of Elizabeth Webber (Rebecca Herbst) and one half of the popular coupling with Dr. Finn (Michael Easton). Many of us are lamenting her loss due to the unexplored relationship between the half-sisters and her burgeoning relationship with Finn. We still hope the show realizes its mistake and hires her back pronto! Related: Rebecca Budig Leaves General Hospital! Now, when Steve Burton’s re-hire was announced around the same time of her firing, many fans theorized Budig was cut loose to make room for Burton’s presumed-large salary. It also did not help ABC played hardball with another fan fave William deVry (Julian Jerome), who was written off during his intense contract negotiations. Now, we seemingly had two show stars fired to make room for one! Luckily, the show and deVry were able to come to an understanding and signed him to a last minute three-year contract! Let’s not forget, the Alphabet network also wrote off both GH stars Rebecca Herbst (Elizabeth Webber) and Roger Howarth (Franco) during their prolonged contract negotiations a while back. Also Read: Steve Burton Returns to General Hospital! So, why is this of any importance, you say? As we know, daily comings & goings along with storyline spoilers are now met with instant feedback in the era of social media on the internet. The way of learning about casting changes and storyline previews in the old days of bi-weekly and weekly soap magazines are long gone! Now, show executives, writers and actors feel pressured to publicly comment on social media when there is an immediate and overwhelming reaction to a certain actor or storyline. Of course, show executives also use social media to tease us about upcoming new exciting storylines and castings. It is just that in the case of Steve Burton, it did not quite work out the way the show execs hoped. See: Steve Burton’s First Day at General Hospital! A Tale of Two Jasons vs a Tale of Two Todds? As we know, many fans are happy with Billy Miller in the Jason Morgan role and are against a Tale of Two Jasons story. The Executive Producer Frank Valentini did a similar one on One Life to Live that fans called the Tale of Two Todds, where the new Todd was made to be a twin to make room for the return of the original actor. Ironically, the original actor returning to his iconic Todd role was no other than our dear Roger Howarth! Related: Steve Burton on returning to General Hospital! Alla Korot to GH – Newsworthy? This brings us to the subject of our article: the casting of Alla Korot. 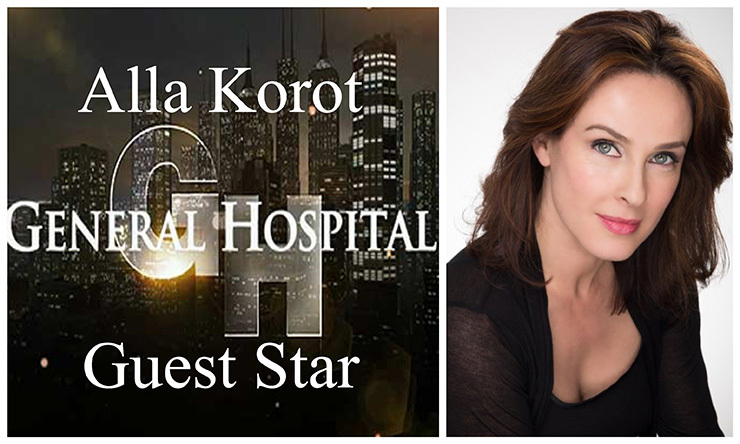 Soap Opera Digest exclusively reported today that former Another World and General Hospital: Night Shift actress Alla Korot was coming to GH. She should be the lead of the article right? Normally, she would be..,well, in fact we did not plan on doing an article on her since the SOD article was just a tiny one paragraph blurb announcing her casting with no additional details given. But when a GH Executive felt the need to respond to what seemed a minor casting role, then boom, we had the story! Or in our case, an editorial worth bringing to you, our dear readers. GH Exec Pressured to Respond? 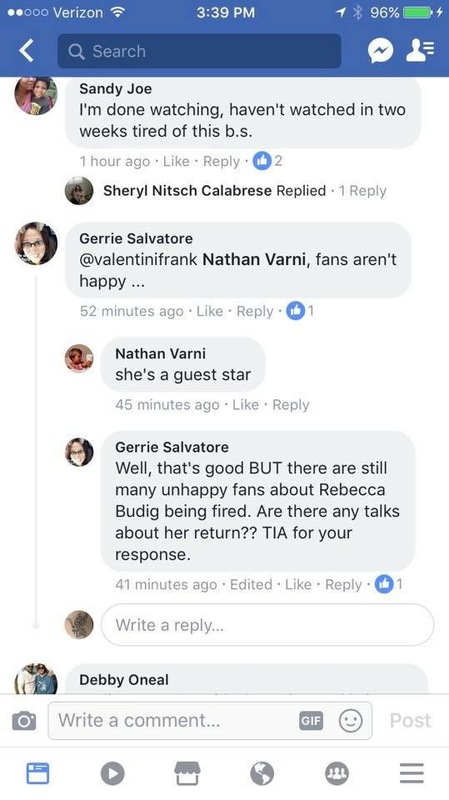 When the casting of Korot was announced, some GH fans still smarting over the re-hiring of Steve Burton and recent firing of Rebecca Budig immediately took it upon themselves to express their displeasure and tag GH Executive Nathan Varni on Facebook. Understandably, it seems Varni felt compelled to calm the fans and reply that Korot was only coming on as “a guest star.” Obviously, Budig was not fired to make room for Korot. But at the same time, any build-up to her character or story is now gone, don’t you agree dear readers? Also Read: Rebecca Budig Dishes Her Goodbye at GHFCW! Lose – Lose All The Way Around? So, in the end, it becomes a lose-lose situation for the show: we (collectively speaking) obviously do not want or care about any new character coming in unless we get our way, i.e. Budig is re-hired, and we also do not care about any beloved soap vets coming on the show as day players, i.e. beloved OLTL vet James dePaiva. He is playing Sam’s doctor instead of his beloved Max Holden character. Of course, bringing him on as Max would be a boon for some of us OLTL fans, but then again, it would receive a major backlash from the OG GH fans who would be upset about the character taking time from their beloved vets already on the air…so maybe it’s a double-edged sword for both us and the show! Previous ArticleThe Bold and the Beautiful Spoilers, Wednesday, August 16th: A Battle for Eric! Next Article Days of Our Lives Spoilers, Thursday, August 17th: “Marlena” Plants a Smooch on Roman! I’m just glad we still have GH but I am upset that Rebeca Buddig is gone. I can’t wait to see how the Jason storyline unfolds. I have a sneaking suspicion that Jane Elliott was forced to retire to make room for Steve Burton. Words will never be able to convey how much we have enjoyed watching Rebecca and her portrayal of Hayden. she made this character, at 1st someone who wasn’t liked. Then slowly, the layers were peeled away, and we fans found ourselves rooting for her.Her friendship with Tracy & Curtis, & blossoming love for Finn and her sister, made us fall in love with Hayden. Beyond unhappy that the Fayden story was totally cut short without exploring her love, for Finn, her baby and a Webber sister legacy, GH made a colossal error in letting this wonderful actress go, yet Tptb have the ability to make it right. Just hope they don’t sit on their hands too long. My pleasure. If you ever need an extra set of eyes for proofreading, I’m available! I rarely have seen more reaction to a Soap firing than Rebecca Budig, she is wonderful and an important part of GH! I think TPTB realize that they have made a mistake and fully expect to see her back very soon. As for Ms. Korot, I am expecting to see her as Oscar’s mom, or at least hoping that she will be. RIght?!? Totally agree on all points. Who is this Anna korort? I don’t think I know her? She was on AW and…another soap. lol It’s in the article above I believe.